They say that the way to a man's heart is through his stomach, and there's no exception when it comes to Dad. This Father's Day, appeal to your dad's sweet tooth with chocolates, candies or cakes in a masculine theme he’s sure to enjoy. Sweet Treat Supply carries a wide variety of Father's Day candy molds so that you can express your appreciation to Dad in a way he'll love. 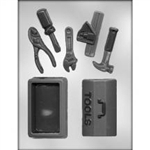 Choose from Father's Day chocolate molds in styles ranging from tools to pistols to ties to trophies. No matter what your dad loves, you'll find a mold to make him a memorable Father's Day present that tastes as good as it looks. If your dad prefers baked goods, shop our selection of Father's Day cake pans. Jerseys, jumping fish and sports-themed molds offer the perfect way to make a dessert that honors Dad on his special day. Shop today to get free shipping on all orders of $100 or more!